Thank you for your ongoing interest in the Wimmera Southern Mallee (WSM) Regional Partnership and in our 2018 Regional Assembly which took place in Stawell on 30 May 2018. 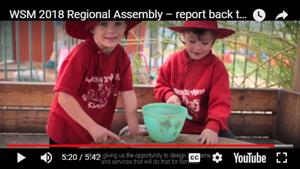 We had over 200 people attend the 2018 Regional Assembly and it is important that we keep you up to date with developments and our work. With that in mind, I am taking this opportunity to write to you as Chair of the WSM Regional Partnership. The 2018 WSM Regional Assembly was the Partnership’s third major opportunity to consult with the community. In addition to local residents, businesses and organisation representatives, the Assembly was attended by five Victorian Government Ministers: the Minister for Agriculture and Regional Development Jaala Pulford; Special Minister of State Gavin Jennings; Minister for Local Government, Consumer Affairs, Gaming and Liquor Regulation Marlene Kairouz; Minister for Aboriginal Affairs, Women and Prevention of Family Violence Natalie Hutchins; Minister for Roads, Road Safety and Ports Luke Donnellan and Parliamentary Secretary for Regional Victoria Danielle Green. The Assembly provided the WSM Regional Partnership an opportunity to present a brief summary of some of its achievements over the past eight months since our last Assembly, and for discussions on the Better Coordination of Regional Planning, Energy, Integrated Service Delivery and Improving Educational Outcomes. As part of the Assembly, we screened a video about some of the Partnership's priorities and achievements over the past year. You can view the video here. As a Partnership, our role is now to take the messages and ideas from our 2018 Assembly and action them. We will present on our 2018 Priorities to the Rural and Regional Ministerial Committee later this month. A share of $33.9 million to build, expand and improve early years infrastructure across Victoria. Again, thank you for giving your time and insight, whether by attending the Assembly, a Deep Dive workshop, a Project Working group or being active on the Engage page. This email was distributed by the Regional Development Victoria on behalf of the Wimmera Southern Mallee Regional Partnership.